The most organic, powerful thing Katrina possess is her voice. So beautiful and enticing, it's hard to imagine her music without it. Raindrops of folk and Americana sprinkled together, her album is a musical journey that longs for attention, while creating companionship among its listeners. There is a lot of talent present on this disc, however, on the first few listens the music runs together like hot summer nights and the stars wide-eyed above you as you sit and dream. Relaxing and very dreamy, sometimes you'll find yourself drifting off into a daydream while you listen to this album. That's the one disadvantage, which happens to be the main strong point for this disc, her voice. It's so captivating that you can't help but want to slip into a dream while listening to the music. Even if you're wide awake and ready to go, if you sit down and start to visualize the songs you will soon find yourself in la-la land swimming in the world's most beautiful rivers with the sun beating down on you in heavenly form. I don't know if this was the goal of the disc, but if it was, they accomplished it with ease. Never awkward, only feelings of love and joy will be generated when you listen. 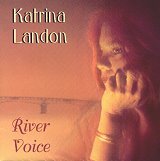 Complicated days and stressful hours will pass off into the clouds when Katrina sooths your wounds with the use of various instruments, a delicate acoustic guitar, and gold notes that leap right out of her mouth and onto your bleeding heart. That's right, this album is definitely something that will ease any pain you might be emerged in. Quiet and soft, while still maintaining an active pulse, these eleven songs will never turn their backs on you. I'll give this disc a B-.